Faith is what gets me through every single day. Not actual faith in God (I'm agnostic, so please, don't take this post to mean that I'm preaching to you. ), but faith that things have to be alright. I'm no Pollyanna by any stretch of the imagination. I'm pessimistic, realistic, and fearful. I am riddled by anxieties every second of every day. 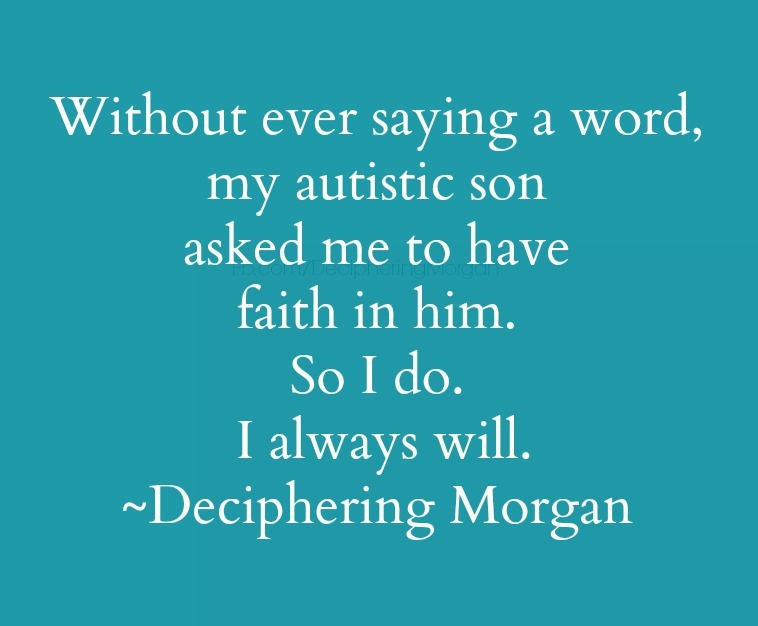 But still, I have faith in Morgan because I feel that's what he is asking of me without ever saying a word. I gave birth to my child knowing that I would be entrusted with his care for at least eighteen years. 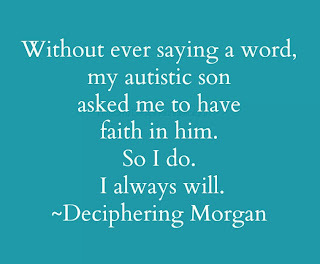 I had no way of knowing that my child would be autistic and that my caring for him might end up looking very different than I imagined. I didn't know that putting faith into my son would serve so many purposes for both of us. And I didn't know then that communication comes in many forms. For what seemed like eons, I wasn't listening to anything but doubts coming from my own head or from other people. I have had to learn to shut out those naysayers and have some faith. I am continuously proud of the progress my son has made. Every time I allow doubt to creep into the recesses of my mind of whether I have been doing right by my child, he astonishes me by showing me what he can do. There are always setbacks, yes, and some worse than others, but I have faith. In him. When the setbacks are bad, I will be right here waiting for Morgan. With open arms and faith that he can do anything. Last night, Morgan read a one page passage to me about the rain forest and the animals in it. A year ago, this would have been impossible to get through in one sitting, one day, or maybe even one week. I'm not sure how much he comprehended because I didn't ask. I was, honestly, too excited that, even though he stumbled through the words, he diligently stuck with the assignment. He finished reading and I teared up. Another goal that someone once suggested he would never attain has been achieved. It has made all of those hours of practice, therapies, supports, and ugly tears on both of our parts worth it. He, at a very young age, and without saying a thing, asked me to have faith in him. And I do. I'm glad that I could do that for you. This has been a long time coming. We're still not 100% on what he's comprehending. We know that he's learning his spelling words by memorization and he seriously struggles with writing... but, to have him read... that's be almost unreal for me.